Does anyone have any pictures or information of what the Commonwealth line (Packard's corner to Chestnut Hill Ave) looked like before the tracks were installed? The same question applies for the Beacon St line from St Mary's to Chestnut Hill Ave. Were there any homes or industries on that right of way that had to be razed? or was it just an open field? The Watertown line looks narrow enough to just put tracks on the street. The Riverside (Highland branch) line already had tracks prior to 1959. Thanks. Cltmotorman wrote: Does anyone have any pictures or information of what the Commonwealth line (Packard's corner to Chestnut Hill Ave) looked like before the tracks were installed? The same question applies for the Beacon St line from St Mary's to Chestnut Hill Ave. Were there any homes or industries on that right of way that had to be razed? or was it just an open field? The Watertown line looks narrow enough to just put tracks on the street. The Riverside (Highland branch) line already had tracks prior to 1959. Thanks. Commonwealth and Beacon were both planned boulevards. Olmstead proposed them, and he did the design on Beacon. Development in the area came after the roads were built...it was all open farmland prior to that. Other than the thoroughfares that were laid out in the late 19th century in the Back Bay landfill those two streets were "new" thoroughfares tied to somebody's Victorian Era ideas about urban renewal. It wasn't organic growth...it was all deliberate and centrally planned. Comm Ave. from Kenmore to Packards and up Brighton Ave. was a horsecar route that got electrified in 1892...Boston's first electric streetcar. I don't think there was ever anything but tracks on the reservation...Comm Ave. Mall always stopped at Kenmore. Beacon, Chestnut Hill Ave., and Lake St./BC got streetcars very soon after. Packards-Chestnut Hill Ave. had no tracks until after 1900(? )...after the subway was built. 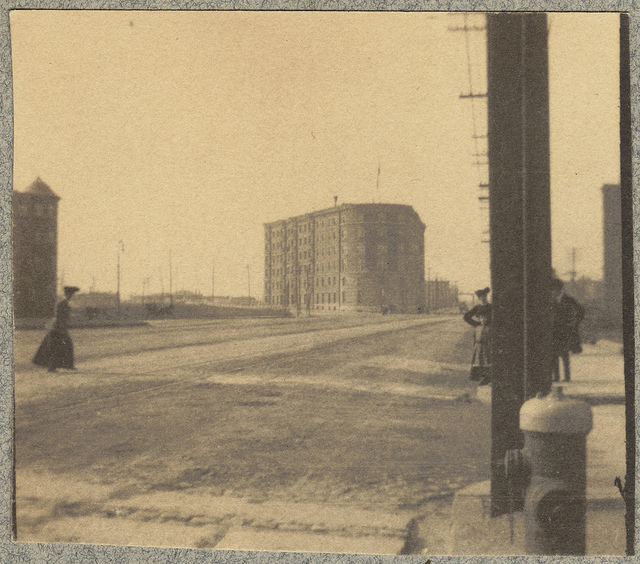 There's at least one photo out there of an 1890's streetcar at Packards with the B tracks up the hill absent. Beacon got built up first and became very desireable very fast. Comm Ave. really lagged behind because people didn't like the boulevard's design up the hill. It was still almost completely empty of buildings as late as 1910. Most of those apartments lining the route are the original buildings that went up after WWI when the corridor got a "bailout" stimulus from the city so it was no longer ridiculed as a road to nowhere. Hard to believe looking at that area now that it was once seen as one of the biggest urban planning flops in the city's history. Trolley reservation was off to the side of the of the road until the mid-1950's when the roadway up the hill got reconstructed with those confusing express lanes. I know there's some color pics of PCC's climbing the hill next to a single undivided road on the hill between Warren and Chestnut Hill Ave. So the configuration past Packards has gotten some minor/moderate alterations. Lower Comm Ave., near BC, and along Beacon are pretty much the original reservations except for the changing buildings and ever-widening roadways through the years. You would probably enjoy the new book, "The Race Underground" by Doug Most. It will answer some of your questions. Service began between Lake St. and the Subway via Commonwealth Av. on May 26, 1900. Prior to that, several different routes were operated to Lake St via the outer end of Beacon St. and Chestnut Hill Av. including a Lake St. via Huntington routing! There was also through service from Newton Center operated jointly by the Elevated and Middlesex & Boston using Elevated cars via Lake St. and Beacon St. after the Commonwealth Av. service opened. The big difference between Beacon Street and Commonwealth Av. was that the land surrounding the Beacon Street Line was owned by a prominent real estate mogul named Henry M. Whitney, who also was President of the West End. He was able to develop the property at low cost, and sell it off once the line opened at a huge profit. This was all done within the town of Brookline, which was seeking development. Brighton, on the other hand was still a largely rural area, and was connected to the city by a narrow strip of land. The initial source of transportation in Brighton was the Cambridge Railroad which established service from Central Sq. to Oak Sq and along Western Av. The initial electric line tapped the market by way of new trackage on Harvard St. to Allston. This was a success, and the route via Brighton and Commonwealth Avs was established to provide a faster route downtown. The hilly territory between Packards Corner and Chestnut Hill Av. was the last part of the line to be built, and there was no incentive for development as there was on Beacon St. 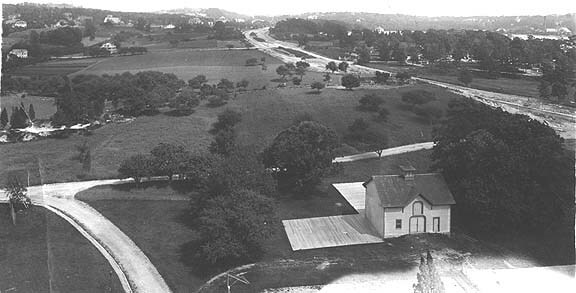 The present layout between Packards Corner and Warren St. was the original layout all the way to Lake St., and indeed extended all the way to Norumbega Park. The tracks were moved to the center during the 1950s from Warren St. to Chestnut Hill Av. and during the 1970s from Chestnut Hill Av. to Lake St. Even today the space devoted to trees along Beacon Street beats the bland landscape of Commonwealth Av. by a tremendous margin. Thanks to all for the great information & pictures. I had no idea how barren Kenmore Sq. and Comm av was at the turn of the century. I just ordered the book "The Race Underground". My grandparents lived in the apartment complex facing Comm Av (watching the streetcars go by was my favorite pastime at 7 years old-No wonder I was addicted to the system) between Chestnut Hill Av and Braeburn. Past the BC station at Lake St, there was another separate line to Norumbega park. That must have been a beautiful ride with all the stately homes on both sides of Comm Av. Thanks again!